The 2014 Lincoln Stars tryout camp concludes Sunday with the lone all-star game, which begins at noon. Click here to view the tryout camp all-star roster. I'm going to use this blog article today to keep a live, running summary of the action as it happens. So just keep hitting refresh after noon to see information added below. I'll use Twitter as well to post info. Players are currently warming up as I type this. The all-star game will be run like a normal game with three, 20-minute periods. -First penalty goes to #3 Royal defenseman Tye Ausmus - Tripping at the 2:00 mark. White on the PP. -Starting goaltenders are Hunter Shepard for Royal and Peyton Jones for White. -GOAL: Team Royal goal scored by forward Michael Gillespie at 11:49 mark of the first period. Nice play by Gillespie to crash the net and pick up a loose rebound a few feet in front of White goaltender Peyton Jones. Team Royal leads 1-0. -The first period is complete with Team Royal leading 1-0 over Team White. 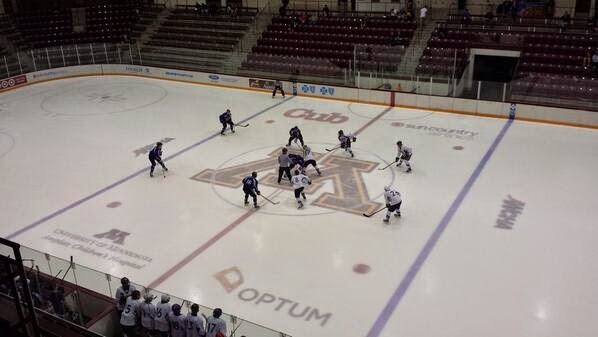 Shots are 12-9 in favor of Team White. I thought both goaltender played very well, especially Hunter Shepard who made some big early saves. Second period coming up in about 15 minutes. -We're underway in the second period. Score is 1-0 Team Royal over Team White. -Switch in goaltenders as White netminder Tommy Nappier and Royal netminder Quentin Prokopetz enter the game. -Hooking penalty on White forward Blake Christensen at the 4:05 mark of the period. Royal goes on the PP. -GOAL: Team White knots the score at 1-1 with a goal from forward Dominick Mersch. Primary assist goes to forward Troy Terry who had a nice curl-drag move before finding the wide open Mersch at the side of the net. -Halfway through the period and the score is still tied at 1-1. Shots are 19-18 in favor of Team White. -Hooking penalty on Royal forward Michael Gillespie. White goes on the PP. -GOAL: With about a little over a minute left in the second period, a Team Royal turnover in their own zone allowed White forward Troy Terry to gain control of the puck before putting it five-hole past goaltender Quentin Prokopetz. White leads 2-1. -End of the period with Team White leading 2-1 over Royal. Shots are 25-24 in favor of Team White. -We're underway in the third period. Team White leads 2-1 over Team Royal. -Royal goaltender Quentin Prokopez, and White goaltender Tommy Nappier are in net to start the period. -GOAL: Team Royal ties it up thanks to a nifty backhand high-glove side shot by forward Biagio Lerario. Nice individual effort by the Stars veteran. -GOAL: Less than a minute after the Lerario goal, Royal strikes again to take a 3-2 lead. This time it was forward Chris Klack with the goal. I have to be honest, I was typing up the Lerario goal and I missed how Klack scored this one. -Penalty to Royal defenseman Tye Ausmus who get a five-minute major for boarding, I believe. White defenseman Cameron Lee was on the receiving end of the hit and was slow to get up. White goes on the PP. -Royal PK unit does a good job of killing the entire five-minute major on Ausmus. -I've just been informed we will play a 10 minute 3-on-3 overtime period after the third period, regardless of the score. -3:46 remaining in the third period with Royal still leading 3-2 over White. -End of regulation with Team Royal on top 3-2. Shots were 34-32 in favor of Royal through three periods. -Halfway thru the period the score is still 3-2 in favor of White. Tommy Nappier and Quentin Prokopetz are back in net for their respective teams. -Royal forward Biagio Lerario is denied on a penalty shot attempt late in the period by White goaltender Tommy Nappier. -Neither team can score in the OT period. Royal wins this one by a score of 3-2. Edit: I'm going to add some of my thoughts from this game here at the end of the article. Speed, skill, and youth. It was certainly on display in the 2014 Lincoln Stars tryout camp all-star game. It's hard to know what the 2014-15 roster will look like on opening night, but if it looks anything like what I watched on Sunday, the Stars will be a much quicker team than they've ever had in the past. They'll likely be a very young team, also. In terms of the goaltenders, I thought all four played very well. Hunter Shepard was tested early and often in the first period as Royal put 12 shots on goal, but he stopped them all. I think it's going to be Hunter Shepard and Peyton Jones (both draft picks) who will end up making Lincoln's 30-player protected roster, which must be turned into the league by July 9th. Shepard and Jones struggled a bit the first couple of days at camp, but I thought both finished very, very strong in the last day or so. For this all-star game, I'm not going list certain players who stood out to me because they all looked great. These players wouldn't have been selected for the all-star game if they hadn't had a great camp. I will, however, name a MVP from each team. My MVP of Team Royal goes forward Biagio Lerario. I've mentioned Biagio's name quite a bit during camp, but he deserves the spotlight. He hustles, plays good defense, hits anything that moves, and scores goals. You can tell he's ready to take a leadership role on this young team, also. My MVP of Team White goes to forward Troy Terry who finished this game with 2 points (1g, 1a). Terry was acquired by the Lincoln Stars just a few weeks ago in the Indiana Ice dispersal draft. The common theme at camp was the amount of young talented players who stood out, and Terry certainly fits that mold. Very smart with the puck, and good hockey IQ. The DU commit should be in Lincoln this fall. That's it for me at the 2014 Lincoln Stars tryout camp! I hope what I offered this week was beneficial to those reading. Later in the week I will post a tryout camp review article, along with my B³ all-star team and total goal statistics from all of the tryout camp games.